My very first digital infrared photo. First, it helps the photographer "see" alternatives to the visually taken for granted. Second, it challenges, both technically and artistically, to help the development of photography skills that can move the photographer beyond the ordinary. Third, it provides a channel to tell stories with our photos differently than may otherwise be possible. Digital infrared photography has become much more accessible and affordable than in the film era. Equipping one's self is easier than it's ever been, and getting easier. Learning the how-to begins with reading readily available blog articles and tutorials and watching training videos. We still call upon standard photography principles for proficient operation of a digital camera converted for infrared photography, and to practice good exposure and composition skills. Technical challenges will always exist with digital photography, color or otherwise - that's the nature of the activity. Where the challenge exists with digital infrared photography is thinking outside of the color box, which is something that needs to be developed through conscientious practice - color photography is a hard habit to break. 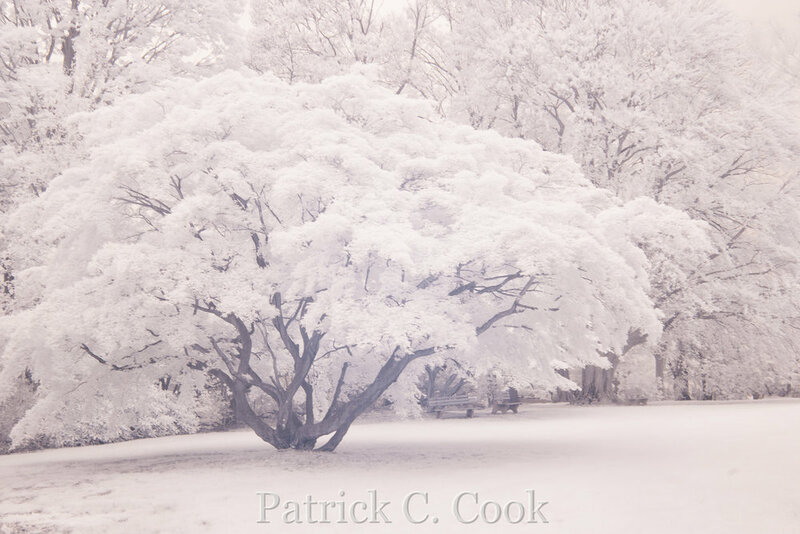 The image above demonstrates my "color vision" mentality at the time of this infrared shot. It's in my back yard that I have seen a thousand times, full of lush green lawn, deciduous trees and some wood of a fence. Pretty common stuff. Except that things change in infrared where the scene objects interact with the infrared radiation differently than color, shadows are hard, the sky goes black and other anomalies that are unique to infrared photography - a challenging activity to master for sure. The good news is that digital infrared photography is accessible to anyone who wants to get involved, with enough help available to get off to a good start. The journey in digital infrared photography then becomes one of training the mind to also be able to visualize the alternative of infrared radiation and getting the camera equipment to perform to that end. I like to think of this as analogous to developing the ability to drive an automobile with automatic transmission and also an automobile with manual transmission, being able to hop in either type of vehicle and drive each proficiently without retraining one's self for each road trip.